Many of us in Los Angeles are stirred by memories and deep feelings in this time after President Mandela’s passing. Those moved to express those feelings to the people of the Republic of South Africa have two venues in Los Angeles to record your condolences. 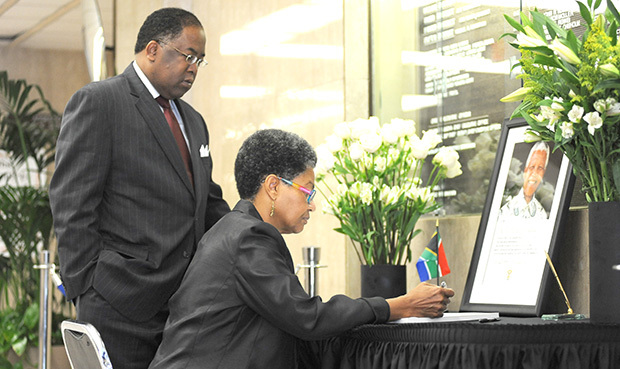 The Consulate of the Republic of South Africa, located at 6300 Wilshire Boulevard, near Wilshire and Crescent Heights, will have a book of condolences open for the public to sign from Monday through Friday, 10 A.M. to 2 P.M. The Board of Supervisors will also have a book of condolences, available Monday through Friday from 7 A.M. to 7 P.M. at the Grand Park entrance of the Kenneth Hahn Hall of Administration. The book will be in the lobby facing Grand Park, between Hill Street and Grand Avenue, and First Street and Temple Street. The Metro rail stop is Civic Center/Grand Park. We have all lost a father that exemplified security, love, humility, service, purpose, determination, resolve, responsibility, kindness, color blindness, courage, strength and too many other qualities to list. It is our obligation to honor him and continue his teaching. True leader in everyway who showed the world the power of love and the courage to stand strong by taking action, he touched the lives of everyone in the world by showing the impossible can be done, never giving up or giving in, his messages remind us all of this same power which lives in each of us to stand up and do something to really restore our communities, he showed us how, Now together we all must copy this daily with our efforts and deeds maintaining a standard of excellence in all that we do. Nelson Mandela – he was a great man. It is through these people the world is changing for the better. Nelson Mandela knew that the man and his life is the most important and tried to make the people in South Africa live better. I admire his achievements and I am very sad that he is gone in this world. It is thanks to him in South Africa, human rights are respected.